Since my children are 3, 4 and 5 I was instantly drawn to Being Four by Kim Cormack. This sweet children’s book is inspired by the author’s son, Cameron who enjoys the adventures that go along with turning four years old. The lovely beach scene photographs take place at Rathtrever Beach on Vancouver Island, British Columbia. The beauty of this book is that it showcases the innocence and wonder of turning four. From the sheer joy of touching a new baby chick, to the security of holding a best friend’s hand, playing in a tub full of bubbles and holding a frog, Being Four is a tribute to a young boy and the depth of a mother’s love. My children were also drawn to Being Four and could relate to the main character’s adventures. They enjoyed sharing their own favorite memories of turning four. This is a nice read aloud story for a young child who is about to turn four or who is experiencing the wonder of being four years old. 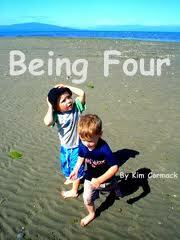 You can purchase Being Four by Kim Cormack on Amazon.com in paperback for $12.00.